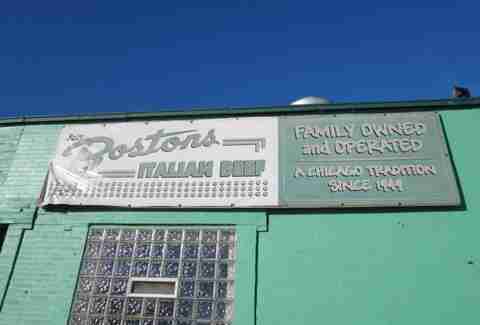 When we did our 10 best Italian beefs a few months back, lots of you chimed in with your favorite neighborhood spots for Chicago’s workingman’s delicacy. Well, consider us inspired: here’s our guide to beef that will satisfy in THIRTY neighborhoods and nearby suburbs (which is where many great beefs have settled). 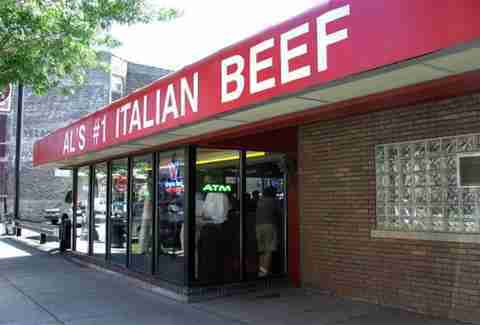 Great Italian beef is often hiding under a sign that says "hot dogs" -- if they take that classic seriously, they may take beef just as seriously. At this bright, friendly spot opposite the end of the Brown Line in Albany Park, the beef stands out for freshly spiced gravy and hand-grilled peppers. Beef rings the West Side just over the city limits, but this is one spot that’s not only stayed in the city, but grown as well, now complete with parking lot. 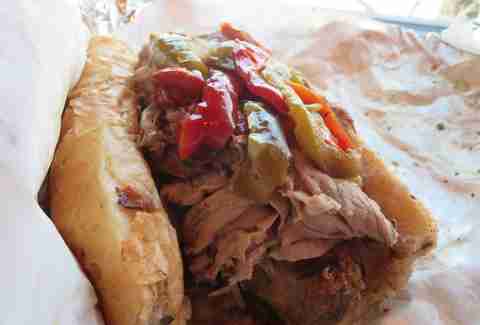 It’s a reliable contender with a rich gravy and a good spicy giardiniera. 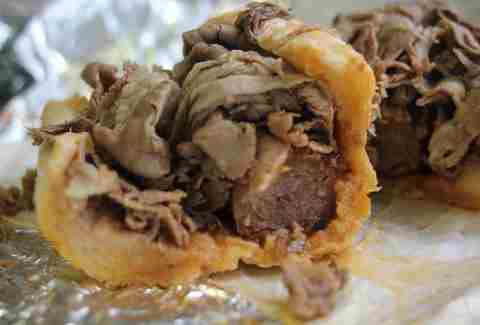 Breaded steak is the first choice for what to do with beef in Bridgeport, but a place like Johnny O’s wouldn’t be caught without an unchanged-in-decades Italian beef on its mile-long menu. Italian beef gets billing well below gyros and other items at this Greek stand, with like 25 guys slinging food behind the counter at any time. But bite into the beef and the fresh-cut fries and you’ll know they take it seriously. A vintage Southwest Side drive-in that feels like you might see your high school quarterback and his cheerleader girlfriend drive up at any moment. Beef is well down the long menu, but it’s pretty good with solid spicy flavor. Enjoy it with one of their most excellent shakes. The number of Mexican items on the menu suggests an old Italian place no longer in touch with its roots. So it's a pleasant surprise that the combo is so good -- well-spiced with sausage that clearly came from a first-rate Italian deli in the area. Best of all, the bread (from Sicilian Bakery on Harlem) was toasted before the beef was dished up -- a nice touch we’ve never seen anywhere else. Best Beef? Hey, this is close to being an Only Beef for its area, where it’s easier to get Ethiopian injera than a Vienna red hot. But it’s a friendly, gently run-down place that turns out totally solid versions of all the Chicago classics, beef included. With no relation to any other Tony’s on the list, this is a market on an Italian strip on the Northwest Side that does a great job with Italian beef and especially the combo, thanks to superior house-made sausage. Have one of their beefs, then hit Conca D’Oro next door for Italian cookies. 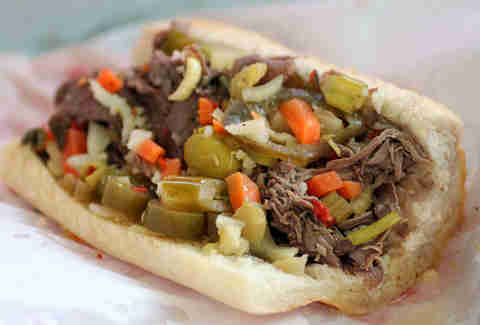 No place better captures the factory lunchbox origins of Italian beef than this no-frills joint near old West Side factories, with its excellent carrot and celery-based giardiniera. 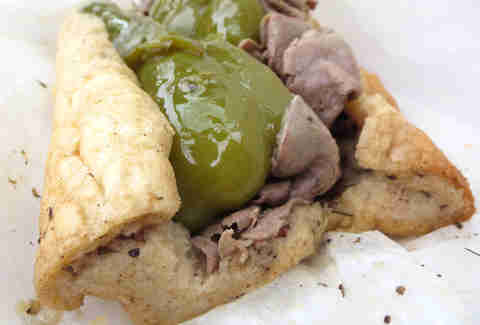 Italian beef next to Illinois Masonic Hospital is one-stop shopping as far as we’re concerned. In relatively beef-light Lakeview, this is a totally legit choice with melty-tender beef and fresh-cut fries. No relation to the legendary Johnnie’s of Elmwood Park, but no shame in their similar names, either. 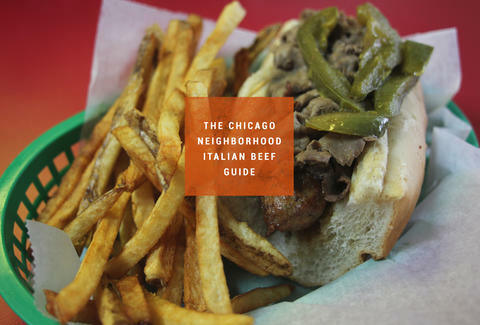 This nice, tidy burger joint includes a very respectable Italian beef on its menu. Max’s Italian Beef is a sentimental favorite in this area, but hey -- across from a cemetery anything living looks good. The better beef is hiding on the menu in this tiny, somewhat surly, but no-BS dog and burger stand. A few places serve Italian beef in the Loop, but if you want the full Chicago experience -- a menu a mile-long that's full of things like baked manicotti, chicken Parm sandwiches, and a beef-sausage combo that’ll put you out for the afternoon -- this is it. 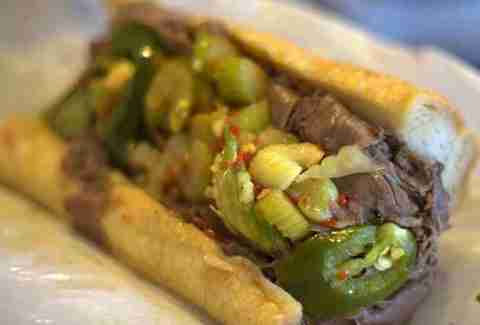 Pop’s (which has several South suburban locations) comes close to ruling the far South Side beef scene, and deservedly so: it’s an excellent beef with good, fresh spicing and an unusual hot-hot giardiniera with celery and jalapeños. A great family-run Italian deli and sandwich shop (used to be a tavern, but Mom & Dad close up early now) near Union Station. 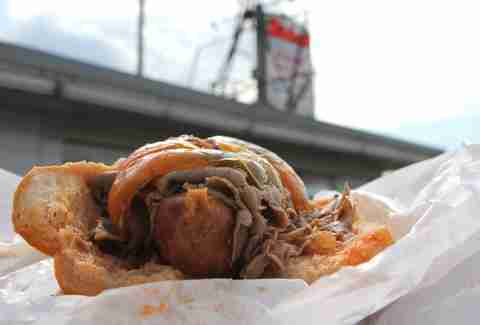 They do a first-rate, juicy beef on great D’Amato’s bread -- but then, they should know how to do it right: Mrs. B’s stepfather was the Al of Al’s Italian Beef. They didn’t change the recipes or the '70s decor, but otherwise the newest owners have breathed fresh life into one of the best beef places on the Northwest side. Unknown outside its neighborhood, but always busy with locals, this is a friendly, well-run dog and burger joint that also does a rock-solid classic Italian beef, because you can’t let the neighborhood down. Portillo’s is a local chain specializing in Chicago classics, and when we left it off the 10 best list, its fans howled. Honestly, we think the beef is good, but not top-10 good. But you can’t argue with true love. A tidy, well-run burger stand that watched its clientele over the years go from working class Joes to stroller Moms taking their toddlers to the park next door. But, with the flavorful, juicy beef and other meaty choices, it remains true to its blue collar roots. An Italian deli at the end of Taylor St that makes a nice (if not great) beef. The spice is one-dimensional, but the roasted peppers are pretty nice. 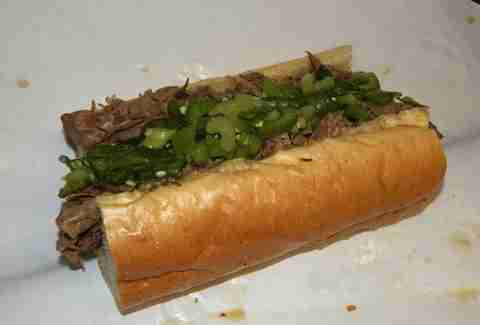 And how often do you get an Italian beef on real China? A cool little Italian grocery, Fiore's is tucked into the neighborhood and makes all kinds of things in-house, including delicious meatballs, which brings us to their genius innovation: an Italian beef combo with... not sausage, but meatballs. Whoa. Al’s was a controversial choice when it came in at No. 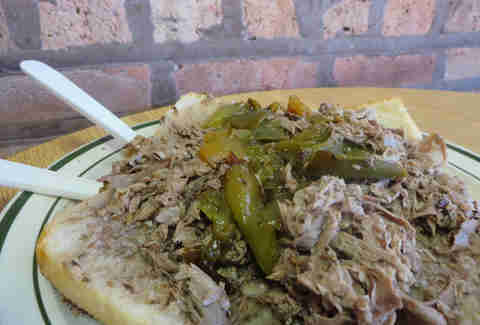 3 on our original Italian beef list; the unique, cinnamon-tinged broth (and high prices) divided readers. We’re in the pro-Al’s camp, especially for a combo with sausage grilled over live charcoal right behind the cash registers. A true South Side stand cranking out bags of hot dogs, pretty good Italian beef, and Polish sausages for cops and other working types all day long. This Italian grocery and sandwich counter sells its celebrated giardiniera in jars, so it already has that advantage. But the beef has other virtues: it’s brightly flavored and, since Bari is take-out only, it comes on a sturdier bread that can survive the trip back to the office. Jay’s home base is in Harwood Heights, and its classic-style beef and fresh, celery-heavy giardiniera could easily earn a spot on our suburban list in addition to their location in otherwise beef-deprived Wicker Park. Their gravy isn't as multidimensional as some, but even so, the combo, with its spicy, fat sausage, proves to be more than the sum of its parts. Anyway, the steady stream of customers, even at off-peak hours, shows it’s a Western suburban favorite. Bright spices set both the beef and the giardiniera a cut above at this stand on Ogden Ave, which also conducts a large catering business in the area. The gravy is especially good here, like a good beef soup, but the best thing is that they’re one of the few who grill their combo sausages over live charcoal. Watch for classic car nights (thanks to the rare, genuinely spacious parking lot). If you grew up here, at some point you probably went to a party where they served Italian beef out of a big tub of meat and gravy from Serrelli’s. At least since they fixed up the place, you can also get a single sandwich to-go, and it’s just what you remembered. Mike Gebert is a James Beard Award-winning food video producer and writer, and founder of SkyFullofBacon.com. Follow him on Twitter @skyfullofbacon.